You must update over v0.2.0.0 for correct core voltage control. *Galaxy Tab Gingerbread 2.3.3 (only in Korea) is available! *GT-I9000 leaked 2.3.4 and Gingerbread 2.3.3 is available! *GalaxyS2 in Korea is available! *Galaxy S Gingerbread 2.3.3(only in Korea) is available! This is for family of Galaxy S and Galaxy S II devices. 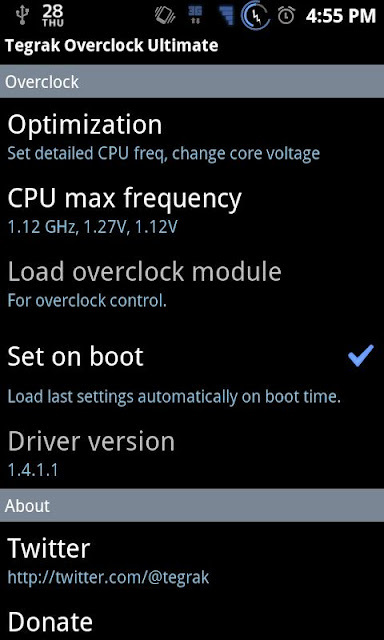 This works with STOCK kernel, STOCK rom, (x)custom kernels and roms(x). OOPS, after Gingerbread, not available on custom kernel that modified kernel source codes(added function symbols..etc). Froyo is still possible on almost customs. You just need to rooting. 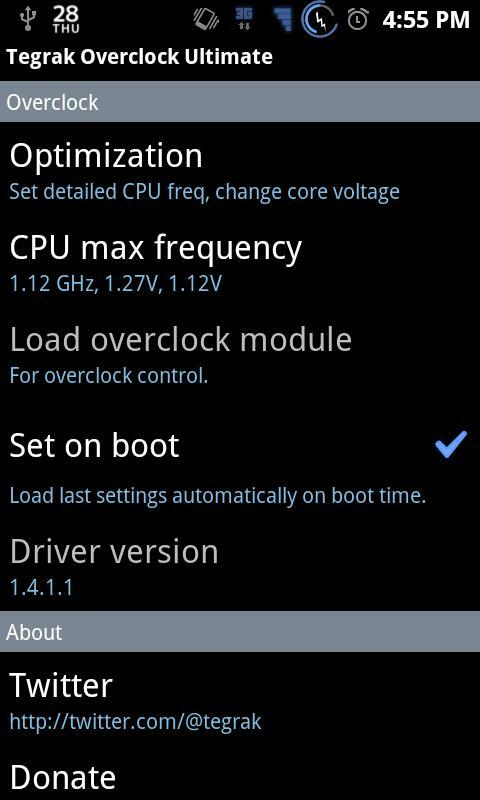 First, click "Load overclock module. Second, click "CPU max frequency" and choose one frequency from preset options. You can control more detailed option in "Optimization" menu. please let me know your device's model number. Sorry, I decided to delay supporting GalaxyTab - in June. added "Profile" menu. you can manage your profiles. supports SHW-M190S Galaxy S Hopping Gingerbread.